Automatic taping with bobbin change-over. Tape cutter with start and finish wiper and automatic unload. 2 handed start button operation. Number of turns of tape is programmable from 1 to 9 turns. Typically 3 seconds per bobbin for 2 turns of tape, cut and auto unload. Taping of ferrite cores, EI laminations and wound coils. 12mm of wound coil cross section. 76mm I.D. standard - other sizes available. Tape roller attachment, winding jigs (tooling), cutter and wiper fixture, safety cover, tape backing removal feature. A high speed automatic coil taping machine for application of insulation tape to wound coils and other electronic components. The coil is placed by an operator on a rotating spindle, and the machine automatically applies the required number of turns of insulation tape, secures the end of the tape with a wiping action, and ejects the coil from the machine. 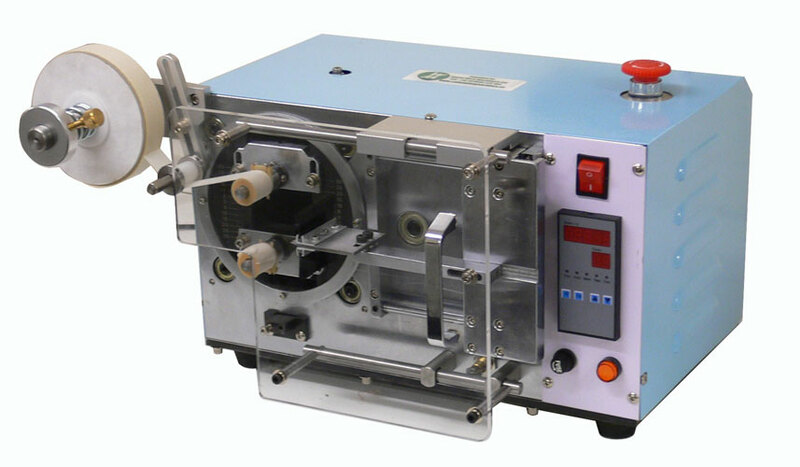 This taping machine is ideal for larger batch quantities of coils, with very high repeatability and fast cycle times. The machine is designed to operate with a wide variety of insulation tapes, including Kapton, Polyester, PEN, PVC, PPS, and most other woven and non-woven types. Please take a moment to view the video demonstration of this machine in operation.